The map and actual locations of the communities are not to scale. Using the Map: Click a location to see more details of community overviews, floor plans, available designs, available homes and any model homes available. 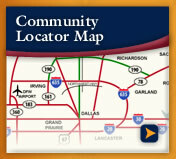 We offer more than 30 communities in the Dallas/ Fort Worth metroplex. Communities range from small, quiet neighborhoods where you can relax and unwind all the way to communities to keep you busy with amenities such as golf courses, parks, pools, fitness centers and more. Register today to find out more information. You're sure to find the one for you! Pool - Amenity Center - Cabana - Trails! Pool - Amenity Center - Trails - Lakes! Large Homesites & walk to elementary school!